You and I didn’t exactly get off to the best start. Last year, I wrote you a letter about how badly I wanted to like you, but how, after a few bad dates, I’d decided that the relationship was not meant to be. Flash forward one year, and these days, I’m singing a different tune. I decided to give you another chance, and while it hasn’t been perfect, this is actually turning into a pretty decent relationship. One I could see lasting long term. So what changed since last June? The biggest problem I had when I tested out Bixi last year was that there was never any place to park my bike. I’d arrive to my office in Vieux-Montréal at morning rush hour, and all the spots would be gone. It was too big a risk to take, since no parking spots meant costly and frustrating delays. When I started my new job last September, I resolved to turn over a new leaf with respect to my commute. No longer was I working downtown, fighting with thousands of other commuters for a Bixi spot. No, instead, I was working in St-Henri, a “from” instead of a “to” area. In the mornings, the Bixi racks would empty out, as local residents took out bikes to head east to their downtown offices. My westbound commute was literally against Bixi traffic, and I found that it was relatively easy to find a parking spot for my bike every morning. Furthermore, my building has convenient showers and changing rooms so I can freshen up and change my clothes, rather than spending the day all sweaty and gross. Suddenly, Bixi became an attractive option again. My commute got longer, sure; the ride down takes me about 30 minutes as opposed to 15. But it still takes me less time to get to work by Bixi than it does by métro. I signed up for an annual membership last fall after a couple of test rides, and found that I enjoyed my commute a lot more. As for the commute home, to be honest, I’ve been mostly using the métro to get back up. Your bikes aren’t bad, but they’re not the most comfortable to ride, and the uphills are killer. Especially the Atwater tunnel; I’ve yet to figure out how to pedal the heavy monstrosity of a bike up that hill. Still, on a few days when public transit was particularly bad (more on that later), I did do the uphill ride, and it’s nice to know that it’s a viable option. Your customer service has gotten a lot better, thanks to some hard lessons about social media. Financing scandals aside, your reps seem to be making a concerted effort this year to listen and respond to comments and questions on Facebook and Twitter. You may not think so, but it makes a big difference. When a station moved seemingly inexplicably, when I had a website problem with my invoice, and when there were questions about a system outage, just knowing I could contact someone to get the information I needed did a lot to inspire more confidence in the system. There’s still some work to be done on this front. The (mis)handling of the Bixi Poésie issue is a case in point. Comments on your Facebook page seem to be answered at random, and I’ve noticed that those posted in French have a higher likelihood of being answered than those in English — something that doesn’t bode well for Bixi’s potential attractiveness to tourists. And your phone customer service reps haven’t quite caught up to your social media folks in terms of responsiveness. But I’m seeing an improvement since last year, so kudos for the step in the right direction. We still need more, but the City of Montreal is doing a decent job expanding and maintaining the network of bike paths and lanes. It’s made cycling through downtown more practical and less dangerous. The De Maisonneuve path is still overcrowded at rush hour, and I hate how all the traffic lights are synchronized for cars instead of for cyclists. But I must say, I really enjoy the start of my ride each morning, cycling through Parc Lafontaine. The main reason I have been using and enjoying Bixi these days actually has nothing to do with Bixi at all, but with the student protest movement, construction season, festival season, and the associated public transit and traffic woes. My morning routine goes something like this: Wake up, get ready, listen to the radio for the news, and take a gamble on which option — car, métro, or Bixi — is likely to get me to work on time with the fewest headaches. And lately, between the construction, the police blockading roads and student protests every day or two, and various smoke bombs and other related or unrelated métro shutdowns, most days, the answer to that question has been Bixi. When you acted quickly to add extra depots and bikes in response to a massive métro shutdown, that did a lot to encourage me that biking was the way to go. In other words, it’s not that Bixi’s so much better; it’s that everything else has gotten worse. STM is no longer “more reliable than Bixi”, and that’s made a difference. Bike maintenance issues. Already this season, I’ve encountered a dozen broken bikes, some of which I had to return immediately. Broken seats and chains and flat tires are the most frequent issues I’ve encountered. I don’t particularly mind the advertising on the bikes (though it is a bit of an eyesore, but I’m happy to let sponsors pay for part of the cost of my membership) but vandalism seems to still be a problem. Water bottle racks, please? I know Bixi is intended for short rides, but frankly, as we get into the hot summer months, a 45-minute ride in the hot summer sun requires hydration. Simply adding a water bottle rack to the bike design would do a lot to help out on that front. Annoying website issues persist. The map is clunky and hard to read, the site won’t remember my login from one session to the next, and system data is frequently outdated. Luckily there are alternate sites, like nixi.ca, with far superior user experiences. I don’t have a smartphone but the fact that there’s no official Bixi app yet, I find shocking, considering the practicality for most users. Too-short season. We had a late start to winter and an early spring this year. Why, then, couldn’t the Bixi season be extended? I don’t necessarily think we have to keep Bixi up and running all winter, but a bit of a longer season would be nice when the weather allows. After all, we’ve paid for “annual” memberships, right? Management issues. 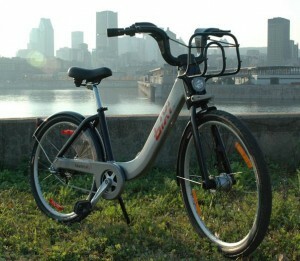 Bixi has been in the news a lot lately for issues related to its mismanagement and questions about whether Montreal will continue to be able to manage international sales. The latest news on this front is encouraging, but there’s still a lot of uncertainty related to the ownership and management of the service. Network efficiency issues. There are still some big problems with the redistribution of bikes from full stations to empty ones, though admittedly, my route these days is such that this impacts me far less than it would impact others. Still, from what I gather on Bixi’s site, most of the comments and complaints are about the lack of bikes or the lack of spots in certain areas. This isn’t an easy logistical problem to solve, and I appreciate that you’re doing what you can, but a few more of those “depot” stations would go a long way towards cutting back user frustration. 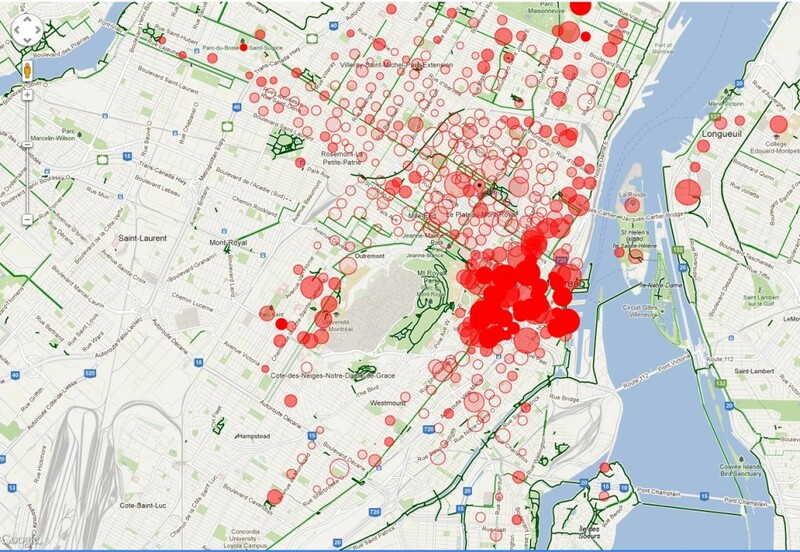 Map of Bixi after morning rush hour, with downtown stations full and residential areas empty. Source: Nixi.ca. Clearly, there’s still a ways to go before Bixi becomes as reliable as other methods of transport. But, despite all of that, Bixi, I have to say, félicitations for the improvements since last year. How do you solve a problem like Bixi? Previous post: University dropout rates: Chicken or egg?